CTET Answer Key 2018 Paper 2 Set N – CBSE has released the official CTET 2018 Answer key on December 28, 2018. Along with the answer key candidates can also download the OMR sheet and against the answer key candidates can also place the objects if required for doing so candidates need to enter the login credentials such as roll number and password on the login page. The result for CTET 2018 shall be announced 6 weeks after the exam date. To check the detailed information about CTET Answer Key 2018 Paper 2 Set N, you can scroll down this page. Latest: CTET 2018 Answer Key and Question Paper for Set N released, Get it from below. The official answer key has been released by the Central Board of Secondary Education. Candidates can now check it from the official website ctet.nic.in. Candidates can match their answers through this CTET Answer Key. 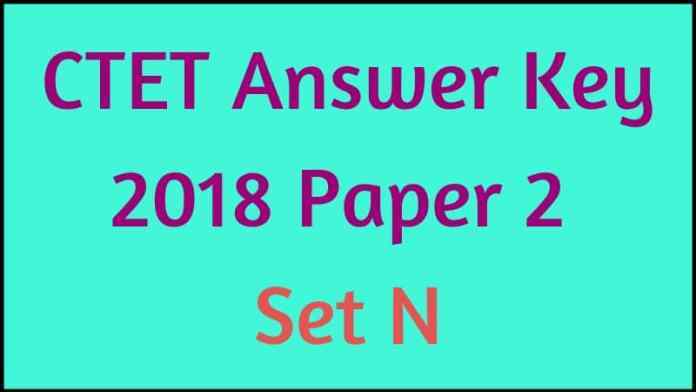 How to Download CTET Answer Key 2018 Paper 2 Set N? Step-1: First of all, you will have to visit the official website of CTET. To do so, we will also provide the direct link on this page above. Step-2: On the homepage, the candidates will be able to click on the log in link. So, there you will have to enter the registration number/ date of birth/ password. Step-3: In this way, the candidates can get the CTET Answer Key 2018. Step-4: It will be available in the pdf format. You are advised to check the answers and download it. Then you can take the printout of it for the future reference. For each question, the board will provide 1 marks. No negative marking is on the exam. How to Calculate Marks through CTET Answer Key 2018 Paper 2 Set N? Provide 1 mark for each correct answer. There will be no deduction for incorrect answers. Add all the marks and it would be the estimated marks. CTET 2018 result is expected to be released after 6 weeks of the exam date. Candidates will get the result online on the official website i.e. ctet.nic.in. It will be available in the candidate’s login. To check the result, you will have to submit the registration number/ password/ date of birth. The Central Teacher Eligibility Test qualifying certificate for appointment will be validated till seven years. The Common Teacher Eligibility Test (CTET) is a national level eligibility test which is conducted by the CBSE. The test is held to determine the eligibility of candidates for teachers for 1st to 5th and 6th to 8th standard classes. Earlier the exam was conducted twice a year, and now it has been shifted to once a year. The CTET is a pen-paper based test in which Paper 1 and Paper 2 is conducted for recruitment of teachers. Wrong Answer keys. Bharat ka Savidhan 26 Nov 1949 ko lagu hua tha dear.